The Motorola RD5000 facilitates implementation of RFID read points in new areas of the enterprise, expands visibility of product movement and enables new productivity-saving applications. The integrated 802.11a/b/g WLAN radios provide flexible, reliable connection with wireless LAN for real-time inventory visibility, features unique to Motorola that deliver superior and reliable wireless connectivity. The integrated Bluetooth enables wireless communication between RD5000 and an on-board vehicle computer for a completely cable-free solution, which ensures constant connection to the onboard computer - even in areas wherethere is no reliable WLAN connection. The RD5000 also includes an integrated rugged antenna that eliminates the need for separate antennas, cables, mounting brackets and connectors to further simplify installation and reduce maintenance. RD5045-20511010-US	 RD5000, Mobile RFID Reader Kit: Supports Uhf Gen 2, Dense Reader Mode, 802.11a/b/g, Bluetooth, Windows CE 5.0, Battery Powered (Uses Same Battery as MC9000-G/-K) US and Canada Only. 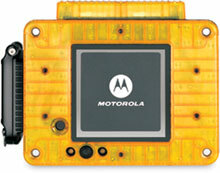 The Motorola RD5045-20511010-US is also known as SYM-RD504520511010US	or RD504520511010US	.